Hello! My name is Blanca and Risa named me. I like Hellos. Hellos are like cookies, you can never have too many. I don’t like Goodbyes. My life is full of Hellos. The garage door opens and I bend down to peer out. Then, it is open wide enough for both of us to walk out. Sometimes we start our walk by saying Hello to Matthew’s family. Matthew’s Dad really knows how to pet a German Shepard. Matthew is a little person just tall enough to look right at me. He gets dog treats from PetSmart for me. Every time I met Matthew he would complement me on my big teeth. We would say Hello to Dylan and his family. Dylan’s Dad always had dog treats for me. Dylan, a little person, would always try to pet any part of me he could reach. A big Hello was Dylan’s Halloween Party. I declined the squirrel costume Kathy made for me, it was very undignified. I was accompanied by a Vampire, a distinguished military man of the fifteen hundred vintage, and a very nice good natured, fun, happy girl who had stepped over to the dark-side to embrace her bad-girl identity. (Really, they were Kathy, Robert and Risa. You could tell by their smell.) The Party was great. Lots of Hellos and smells. While the Vampire chatted with her second glass of wine, I discovered the ultimate party favor — a big bag full of abandoned paper plates covered with ketchup, hot dogs, buns, chips and other goodies. Dylan has the best parties. There are a lot of Hellos at PetSmart. Everyone is friendly, and there are rows and rows of food. One time there was a cat show when we arrived. Kathy made us leave right away on a very short leash. What? Miss those rows of food, and the free dog cookies? I am sure I would have behaved well. Did I tell you about my Commitment? I have a commitment to annihilate all cats, squirrels and mice on the planet. It’s a big job, and I’m up for it. There is a lot of cats on our walks. I chase the two cats that nap under a bush at Matthew’s house every chance I get. One time I chased a cat that was hiding under a car. That cat was so scared he ran from under the car, where he was safe, and we could hear his nails scrap the pavement even fifty feet away. 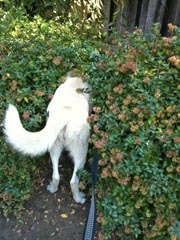 There is a big bush that I like to check out. Sometimes there is something under it — a cat or a mouse. When we walk Kathy talks to herself, sometimes. She says she is on the phone but there is no one else around. Checking out the bush, or anything else, when Kathy is “on the phone” is always the best. Just keep the leash loose so she doesn’t turn around. One time I found a cat that was not running away — the best kind. I couldn’t resist I yanked on the leash, the bush was shaking fast and hard as I tried to reach the hissing spitting cat. Oh such sweet music was coming out of that cat. Then suddenly, I was being pulled back. Oh no. I leaned forward towards the cat. Kathy leaned backward and slowly, oh so slowly, I was pulled back. Next time Cat! — it will be different. I caught a mouse. I could feel it wiggling, it’s tail hung out of one side of my mouth. I wasn’t letting go. Kathy told me to drop it. Who is she kidding? Then Kathy stood over me, a foot on either side of me, with a hand over the top of my mouth and a hand under my mouth. She tried to pry open my mouth. Who is she kidding? “Drop it,” she ordered and she rocked my head up and down as she tried to pull my mouth open, the mouse tail flapping. Who is she kidding? Then as suddenly as I caught it, the mouse stopped moving and I dropped it. Cars are like Goodbyes, it is best not to get near them. I knew Kathy wanted me to get in the car. I kept pretending that I didn’t know what she wanted. One day, she was on one end of the leash and I was on the other. I didn’t trade my dignity cheaply. After a whole bag of peanut butter dog cookies I sat in the car. Twice. Briefly. I discovered something important. When you get out of the car, you get to say Hello to lots of people. Sometimes you don’t even have to get out of the car, people will get in and say Hello to you. Car trips are ok. We went on many car trips. We visited Beau and his Human. Beau likes to hide raw-hide bones and I like to hunt for rawhide bones. I had many snacks. In the morning there was eggs and bacon in my dish for breakfast! We went on the longest walk ever. I saw rabbits, deer, birds that don’t fly, horses, and a cat. The smells were wonderful. Visiting Andrea and Frank was fun. They are a pack without a dog. So for a few days they were part of my pack. Frank and I went hunting for ground squirrels. I was in heaven. Andrea would talk and paint, and I would listen. I am a good listener. Sometimes I listen with my eyes closed. Andrea promised me fried cat for dinner. I guess she is still cooking it. Monique joined our pack for awhile. We napped, ate, walked, watched TV, and rode in the car together. Kobuk’s Human brought me to visit a big Human pack. The biggest pack I have ever smelled. They call it a conference. My job was to say Hello to as many Humans as possible. I did a good job. We had lots of Hellos and cookies. My tail was tired. I got to hang out with Butler and Zoro. Butler’s Human combed me and combed me and combed me. 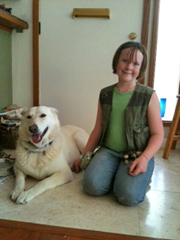 I was the whitest German Shepard. l hung out with Butler’s pack until Kathy came to pick me up. One day the garage door opened, and Kathy and I stood, leash-less, in front of the garage and and smelled the air and felt the sun. The sun was warm. It was a great day. In the distance I could see a squirrel run down a tree and hop on the ground. I thought about heading over there, but it was enough to stand and feel the sun. The Human who delivers mail stopped by for a Hello. I wagged my tail briefly and it felt heavy. She stood there armed with her mace and other anti-dog weaponry and petted me and told us about her dog. Dylan’s Mom came over for a Hello. We all stood appreciating the day and the moment. Most days Kathy goes to work. I can tell she is leaving because she will put on clothes that smell different. Sometimes she says sternly “don’t touch the woman in her work clothes” .. something about fur. She goes into the garage, I hear the garage door open, the car start and the garage door close. I know she will be coming home, and I will nap until she does. P.S. 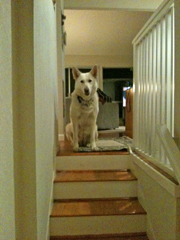 I am still looking for the cat that peed on the front steps.